We're back from NYC, exhausted, jet-lagged and turning in. 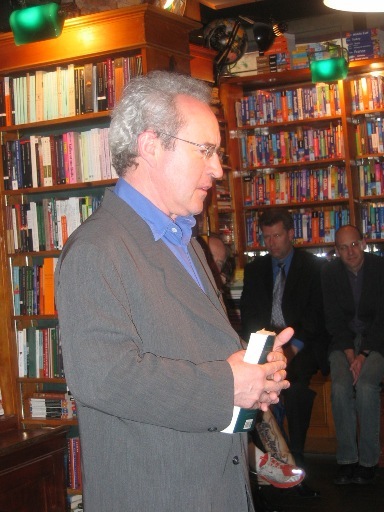 We do have stories to tell, especially the story of MOTEV's cell phone mishaps during John Banville's reading Friday night at Three Lives. Our interview with him the following day, conducted over lunch at Bouley, surpassed all our expectations and culiminated in a mad dash to Penn Station to catch his Boston-bound train with seven minutes to spare. We've begun transcribing this lengthy interview which ran to nearly three hours, and will get it up here as soon as humanly possible. In the meantime, you might want to check out the Prospect's take on his new novel The Sea (with thanks to Dave Lull). Three hours. Wow. Does one allow oneself to consume any food during such an absorbing activity? Surely nothing sloppy. Even if the tape is doing most of the work, so to speak. Looking forward to the fruits of your labours! Please tell MOTEV I'm sorry about the cell phone snafu and that I'll try again later this week. The Sea is shipping from Amazon UK as of today. Some of us don't get reader copies .